I am using different kinds of encryption for my new 2014’s Messenger C-Client. The main advantage of symmetric encryption for me, is that is cheap in terms of CPU usage. When I send files thought my messenger all the data blocks have to be encrypted, and so, if I send the Ubuntu 14.10 ISO image, this is a lot of data to encrypt, and in order to get a good throughput and performance I needed to find an outstanding optimal way to do it, that is at the same time secure. Many encryption techniques and algorithms can be used, and all at the same time over the same packets to make them more secure. In this article I will describe only an improvement to the symmetric encryption to make it no predictable and very fast, so cheap to use. So I introduce the concept here of noise, or entropy, in symmetric data packets. 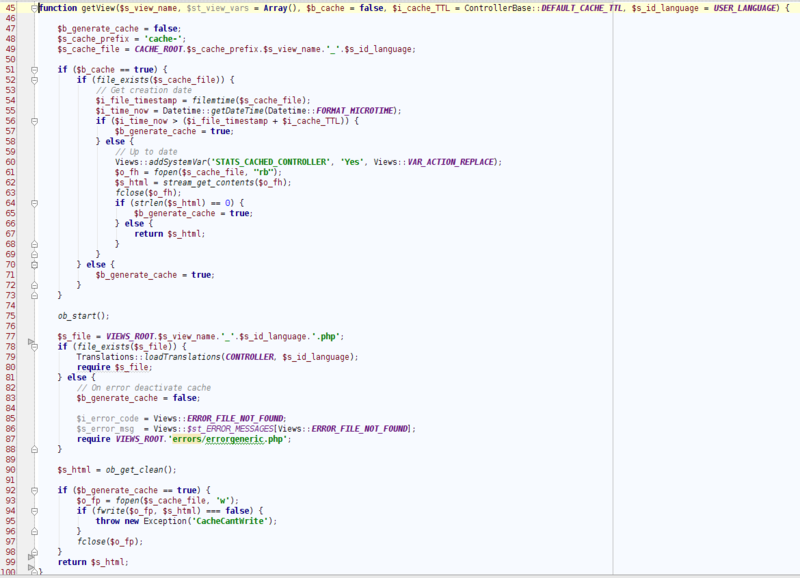 For clarity, only base64 are used in this sample, no binary data. The problem is that every time that you send this chunk of data, you’ll get the same encrypted string. This is predictable and can lead to someone to reverse engineer your password. Then here is the cheap way that consist in making the original data always be different, that I came with. If you’re reading this article you already know, but just in case, the f47ac10b-58cc-4372-a567-0e02b2c3d479 is an UUID. The pipe | is for clarity, as the UUID has a length fix it is not really needed to manipulate the string. Having this UUID in here is also cool, as it will allow us to do things like using this UUID as the password for the next packet. So if our messenger starts with the user’s password, from there the next packets could use this UUID as password (and the next one, the previously random generated UUID and so on…) so every packet has a new password, that must be known from the previous history in order to get all the packets description. So if a man-in-the-middle is capturing all the data sent, hoping to being able to break the encryption in a near future, it will have to be sure to record all the packets to decode the sequence easily, otherwise will have to fight to break every single packet. So UUID is random, but is not noise at all. It is useful entropy. Another thing that we can do to is set a timestamp on the packet, that way, even if a man in the middle is able to clone and later send the initial packet to the Server, it will be discarded. The second field is the unix timestamp, so our Server that has tracked the time or the Client’s computer and knows its rid, knows that if he gets a timestamp in the packet that has more than 2 seconds of difference, it will discard the packet and end the connection. So no one in-the-middle will be able to success cloning a login packet, and injecting it to the Server. So having a basic encapsulation, that is cheap, for transport, the data inside can be also in addition be encrypted with asymmetric and other mechanisms that guarantee that only Client1 and Client2 can decrypt it, and not the Server, while the Server ensures packets are compliant and no noise/attacks are sent though the Server to Clients. This entry was posted in Operation costs, Performance, Software development and tagged c-client, encryption, Java, Security, UUID on 2015-04-02 by Carles Mateo. This article is contributed to Luna Cloud blog by Carles Mateo. We architects, developers and start ups are facing new challenges. We have now to create applications that have to scale and scale at world-wide level. That puts over the table big and exciting challenges. 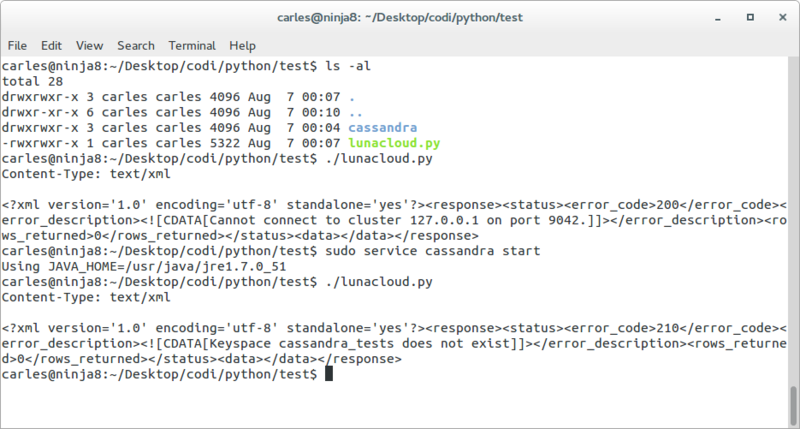 In this article I will cover the first steps to develop with Cassandra, under the Developer point of view. You can have several small, cheap, commodity servers, with big SATA disks with better result than one very big, very expensive, and unable-to-scale-more server with SSD or SAS expensive disks. Cassandra is based in key/value philosophy but with columns. It supports multiple columns. That’s cool, as theoretically it supports 2 GB per column (at practical level is not recommended to go with data so big, specially in multi-user environments). I will not lie to you: It is another paradigm, and comes with a lot of knowledge to acquire, but it is necessary and a price worth to pay for being able of scaling at nowadays required levels. 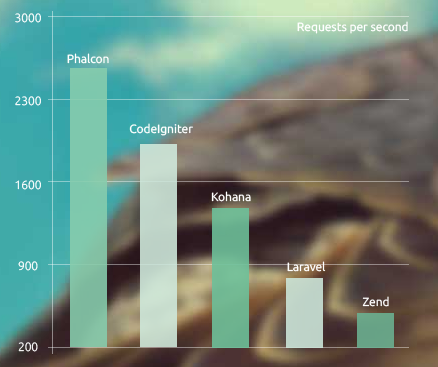 Cassandra only offers native drivers for: Java, .NET, C++ and Python 2.7. The rest of solutions are contributed, sadly most of them are outdated and unmantained. 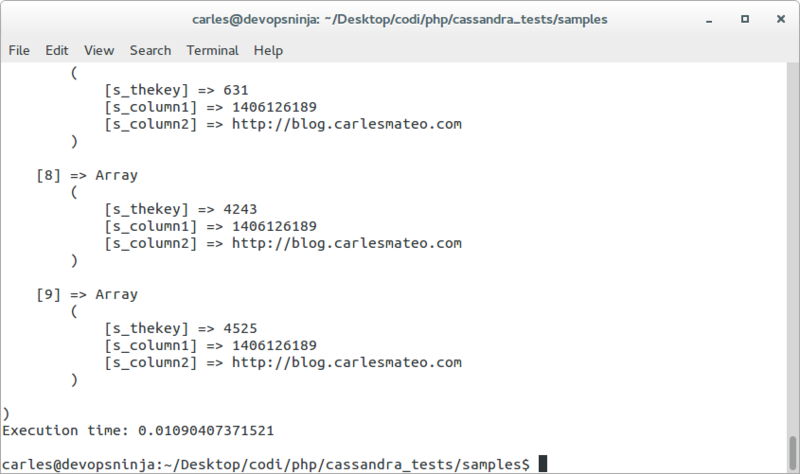 Cassandra has no PHP driver officially, but has some contributed solutions. 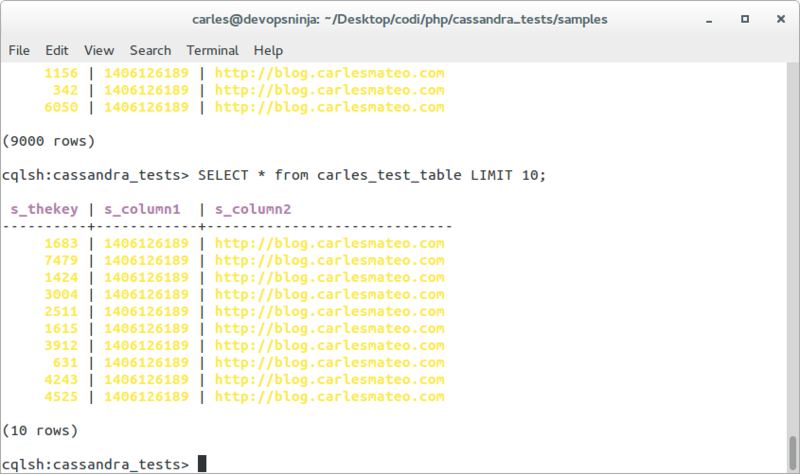 By myself I created several solutions: CQLSÍ uses cqlsh to perform queries and interfaces without needing Thrift, and Cassandra Universal Driver is a Web Gateway that I wrote in Python that allows you to query Cassandra from any language, and recently I contributed to a PHP driver that speaks the Cassandra binary protocol (v1) directly using Tcp/Ip sockets. That’s the best solution for me by now, as it is the fastest and it doesn’t need any third party library nor Thrift neither. 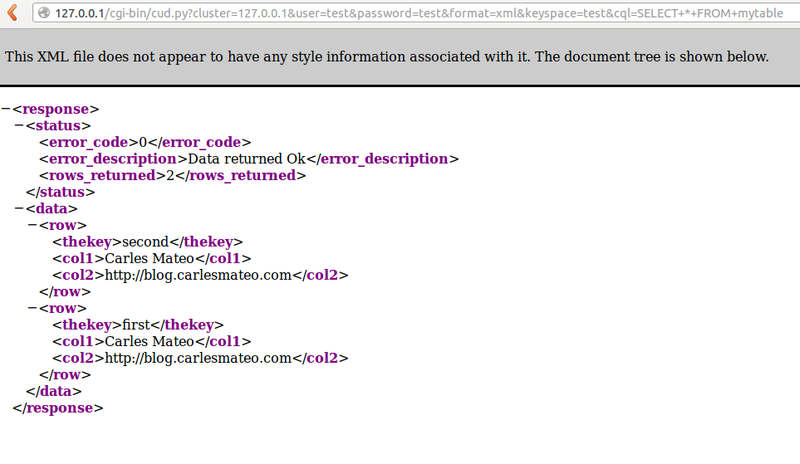 KeySpace is the equivalent to a database in MySQL. If we don’t plan to insert UTF-8 strings, we can use VARCHAR instead of TEXT type. 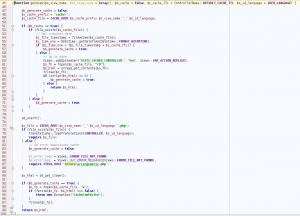 In this sample we create an Array of 100 elements, we serialize it, and then we store it. This insert took Execution time: 0.0091850757598877 seconds executed from CLI (Command line). If the INSERT works well you’ll have a [result] => ‘success’ in the resulting array. Here we do 9000 inserts. Those 9,000 INSERTs takes 6.49 seconds in my test virtual machine, executed from CLI (Command line). echoing as array with print_r takes Execution time: 0.01090407371521 seconds (the cost of printing is high). If you don’t print the rows, it takes only Execution time: 0.00714111328125 seconds. Selecting 9,000 rows, if you don’t print them, takes Execution time: 0.18086194992065. The official driver for Java works very well. The only initial difficulties may be to create the libraries required with Maven and to deal with the different Cassandra native data types. 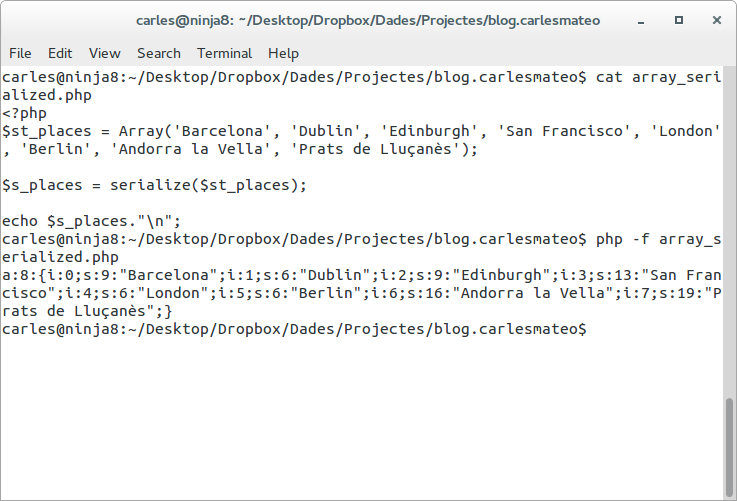 To make that travel easy, I describe what you have to do to generate the libraries and provide you with a Db Class made by me that will abstract you from dealing with Data types and provide a simple ArrayList with the field names and all the data as String. Datastax provides the pom.xml for maven so you’ll create you jar files. 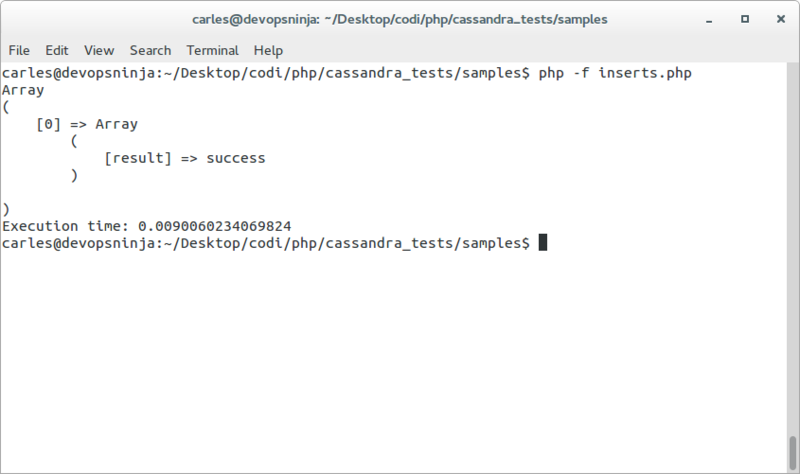 Then you can copy those jar file to Libraries folder of any project you want to use Cassandra with. * You can use this code freely, or modify it. There is no currently driver for Python 3. I requested Datastax and they told me that they are working in a new driver for Python 3. The problem is the same as with Java, the different data types are hard to deal with. So I created a function convert_to_string that converts known data types to String, and so later we will only deal with Strings. In this sample, the results of the query are rendered in xml or in html. s_html_output = u"<?xml version='1.0' encoding='utf-8' standalone='yes'?>"
As mentioned above if you use a language Tcp/Ip enabled very new, or very old like ASP or ColdFusion, or from Unix command line and you want to use it with Cassandra, you can use my solution http://www.cassandradriver.com/. It is basically a Web Gateway able to speak XML, JSon or CSV alike. It relies on the official Datastax’s python driver. It is not so fast as a native driver, but it works pretty well and allows you to split your architecture in interesting ways, like intermediate layers to restrict even more security (For example WebServers may query the gateway, that will enstrict tome permissions instead of having direct access to the Cassandra Cluster. That can also be used to perform real-time map-reduce operations on the amount of data returned by the Cassandras, so freeing the webservers from that task and saving CPU). That way Cassandra will believe your system memory is 512 MB and reserve only 256 MB for its use. 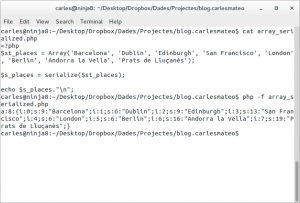 This entry was posted in NoSql, Operation costs, Performance, Software development, Web development and tagged Cassandra, Java, LunaCloud, NoSql, PHP, Python on 2014-07-31 by Carles Mateo. If you’re a Developer or an Entrepreneur to avoid Cloud is not an option. It is a must to use the Cloud. Because if your project is a success, you’ll need to scale very fast from a single server to many, just to attend the increasing number of users. And if you have a lot of users, you’ll need a lot of bandwidth. Even if you have a single server, but want to serve video, will need a lot of bandwidth to serve data fast. Here is where Cloud is not an option. It’s a must. If you use a big server with a lot of RAM or CPUs, or several servers, Amazon EC2 is very expensive. But to start with the needed power, and to be able to grow really fast, and to pay as you go there is no other option. The smaller instance from Amazon, is able to serve 150 Mbit per second. If you need to serve video, where would you be able to deliver it at 150 Mbit/sec rates at 17 € / 14.67 £ / US $23 per month?. It’s not a matter of something fashion, there’s not alternative. With the privative price of dedicated bandwidth in the data centres, no one else can offer something similar even for then times this price. So if you need to be able to pass from a server to 20 or 100 with a click and within a minute, and you need to deliver contents very fast there is no other option. With Amazon Cloud since you pay per hour, you can create 20 instances to face a rise of visitors, due to a campaign or because you have top visitors window of time, you can create instances as you need and destroy them when you don’t need them and pay only for the hours used. So when your Start up is growing and low on money/resources, you save the costs of buying several physical server ($2,000 each), the time of installing, of replacing if a motherboard or disk crashes, and simply creating new instances in the Amazon Cloud as you need, and paying only for the time you use them. So you can save the costs and grow as you need. The cost of the transferred Gigabyte is another reason. One month I transferred 287 GB and paid only $50. An small ISP can’t beat this nor even compete with this price and speed. 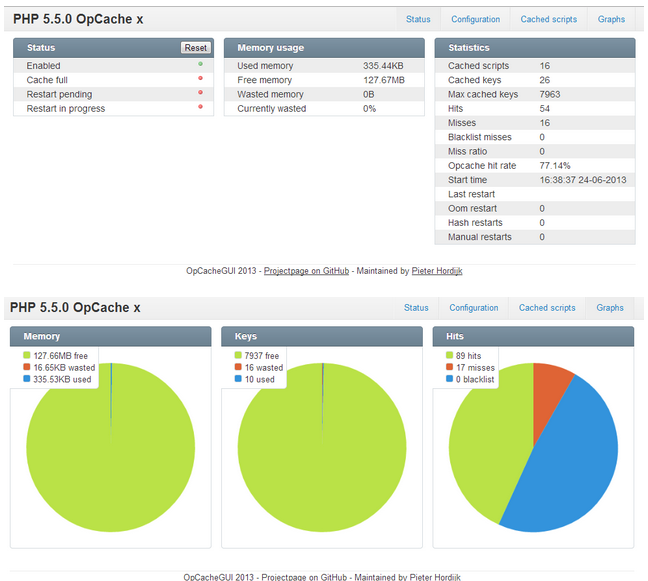 This entry was posted in Amazon EC2, Bandwidth, Cloud providers, Operation costs and tagged Amazon EC2, Cloud providers, Cost saving, Instances, Servers on 2013-02-22 by Carles Mateo.